Thread: Rifled Pump Shotgun... Advice? I have the 88 in 20 & 12, never a problem. SIL has 870 in 12 & 20 (plus the youth models for kids). Bent rims lock them up constantly. And they all were 100$ more than mine. Mine shoot shot exceptionally well. Poly stock is fine. Yay! it arrived! I am the proud new owner of a gently used Mossberg 500 Slugster! It is in pretty much near new shape except for a scratch on one side of the receiver. Not the best pic but the gun does look great! Don't know if it shows up well but there is virtually no wear inside! I am a happy camper! I know guns sell for less in the States but I have to think I got a pretty good deal in Canada. Also, the service at Ellwood Epps store was great! They did a terrific job of packing, it was bomb proof! I will be watching for more good deals on the internet at Ellwood Epps. I wouldn't hesitate to give them more business. Now to slug the bore which is obviously tighter than my single shot. My 0.729" as cast slugs don't quite start in the muzzle where they fall through my single shot bore. This is supposed to be cylinder bore but I'll double check that too. Looking forward to shooting this gun! It is exactly what I was looking for... well after receiving so much advice anyway. Okay so I cleaned then slugged the bore with a 0.735" RB. Bore appears to be right on 0.730" and is cylinder bore. So it is 0.003" tighter bore than my other slug gun. 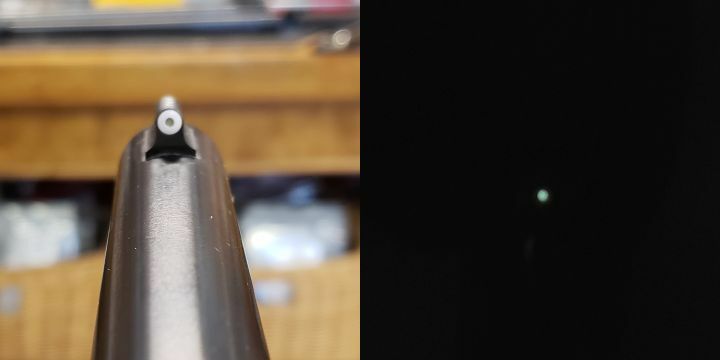 I haven't slugged my BPS which I should do but it has an I/C choke which is seemingly tighter than I/C should be but slugs I have loaded for it take that choke into account so I haven't worried much about the bore diameter. So, my TC thick skirt slugs that cast at 0.729"/0.730" should be perfect for this gun. I found I had to knurl them up then size back to suit my other gun. this is why I like ribbed slugs that are over bore diameter so swage to fit regardless of bore diameter... within reason. Anyway, there are a few blemishes but nothing serious and internals are excellent with a mirror like bore so all good. There's a couple small spots of rust near the muzzle around the site base but again nothing serious and no rust in the bore. It is cleaned, slugged and oiled. Now waiting for me to load up and shoot! Also, the barrel seems very tight. No slop in the receiver. Maybe I should look at getting a rifled barrel for this gun. Very nice! I didn't realize they made a shorter one, that must be a 20" barrel. I've only ever seen 24" from Mossberg. 20" should be absolutely perfect. The slugsters shoot the .735" round ball exceptionally well. See,,, now I told you. That is a cool gun! Wood furniture and 18" barrel with rifle sights! You scored!!! Please put up a close up pic of the Front and Rear Sights. I have never seen one in that configuration. That gun is exactly what you were looking for as a bear gun. All you need is the bigger safety button and a sling mounted on the side. You done good and glad to see it. You'll beaming ear to ear at the Range! Its actually 18 1/2" barrel and cylinder bore all the way. Rear sight is a flip up simple rifle sight with a vertically adjustable leaf with notch in it. Front sight is a typical bead type rifle sight. I'll try to take a couple of close up pics of the sights later. It really seems to have been shot little and from the marks on it I wonder if someone bought it, pulled the trigger once, dropped it or let it fly and decided it wasn't gun for them! There is literally no visible wear on anything... I mean the bluing isn't even scratched on the mag tube or action bars, like it hasn't been used. Unfortunately there are a couple of small rust spots but really not serious and purely cosmetic anyway. Yes, Randy it is exactly what I was looking for except it is so tight I am thinking maybe rifled barrel down the road? For now though it is perfect and I look forward to trying it out soon. Not only do I have lots of slugs cast I still have some of the Russian paradox slugs KrakenFan69 sent me. They are slightly small for my other gun so i knurled them up and they are waiting to be loaded. They are still a bit undersize for this Mossberg barrel but not by much and being soft lead I can likely use the knurled slugs anyway so I may shoot them out of the new gun after I establish accuracy with it. And thanks for the hard sell on Mossberg! You and a few others convinced me to try it and I am liking what I am seeing so far... and feeling when operating the action. It is quite snug and not really rattly like I was expecting. In fact I think it is tighter than my son's 870. I'll get it out and compare. I am really wanting that NOE Lyman clone mould after seeing yours and Ranch Dog's pics. Those are beautiful! Even though work has been sparse and expenses high I may just order one. Like I need another slug mould! But sometimes a guy just hasta! My home made TC mould slugs shoot quite well and are likely a match for the Lyman but I won't know unless I try and if I get a rifled gun, or rifled barrel for this gun, it is one more design to try in the search for best accuracy. A new gun should get a new mould... yes? Congratulations, LB! That is beautiful, and MUCH better looking than mine. Actually, I wish mine was 18.5” like yours, but it’s the common 24”. I was thinking that 20" is the ideal barrel length but I am not going to complain or worry about 1 1/2". This gun is nice enough I am already thinking I need something else for my knock around gun! however, now that I have one Mossberg 500 maybe I can find a more beat up one cheaper and maybe pick up a rifled barrel and other interchangeable accessories! There is no end to this... except lack of money! Seriously, I think this is a nice gun and good deal. I won't be intentionally beating the gun up though it will be joining me in the bush as well as at the range. I do think I will keep my eyes open for another one and if I can find one a little more abused that may become my bear gun. Is yours smoothbore or rifled? I see the rifled barrels tend to be 24" for Mossberg and I am guessing that is because they are used for hunting more than defense. However, with a scope a 20" barrel is likely not giving up anything over a 24" and makes the gun handier. My thought if I had wound up with a 24" rifled barrel with cantilever scope mount was to cut it down to 20" or 22". With no front site to re-mount that's pretty easy. With rifle sights, not so much but silver soldering a front sight back on isn't that hard if a guy is motivated. Anyway, I am happy with what I have for sure. Mine is smoothbore, and by your description, it has the same sights yours does. My receiver is scratched up, including all the finish being worn off where the slide touches it as you cycle the gun, but it is smooth and accurate. Don’t get me wrong, it isn’t scratched up enough to look like ****, but more looking well used. I’m not complaining. I have a few ported, non-ported, smooth and rifled slug barrels. My smooth bore is non-ported and i want to say it is 20 inches. It can easily fire anything you want, buck, ball, and slug. The Mihec Lyman 525 mold is a beautiful thing. You done good with that one. Oh my! I do love the 500 with wood! On Christmas '71, my dad gave me a New Haven 600 which was the discount store version of the 500. 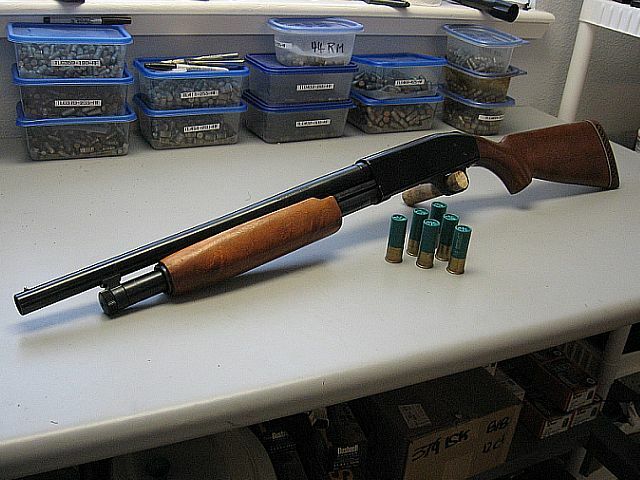 I've bought a lot of shotguns over the years, but none have survived against the New Haven. I bought a 20" cylinder bore barrel a few years back. I've killed all kinds of critters with it, and if I want to get serious about hogs, it is what I use. My area of South Texas is loaded with hogs, not my ranch. I've only seen six this entire year and killed four of those. The Mossberg is my go-to firearm for eliminating a sounder. You want to stop a hog problem; you got to make it tough on the sows. You got to kill her and as many in the sounder as you can in the first ambush. 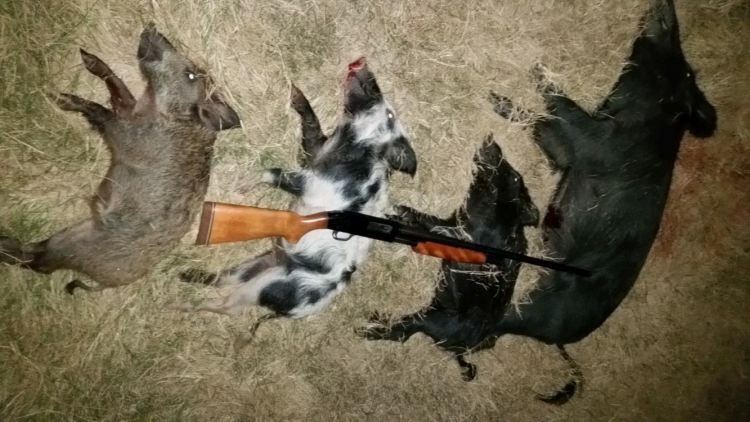 I shoot the hogs in order of size as the coyotes will clean up the little ones in a single night. The last sounder that crossed my fenceline was late last year. In two ambushes, I killed eleven of thirteen with a total of three shots. Coyotes killed the other two. Here is a picture of a typical Mossberg kill'n. My choice of projectiles are BBs, and that comes from experience. You will kill more with a single shot than you will with buckshot. Also, I get them under a deer feeder at night and BBs deflect off of the feeder legs were a buckshot roundball, of any size, will collapse a feeder leg. Don't want to do that again! I even went as far as patterning the distance that it takes to keep about 90% of the BBs within the feeder legs. That worked out to 25 to35-yards, depending on the barrel, with Remington 3" Express BB loads. I'm not even sure they offer the load anymore, I bought 1K rounds of it in 1979, and I'm just a few rounds of being out. That's a lot of hogs in my lifetime! Oh, hogs under a feeder are easy at night as long as the feed is confined within of the feeder legs. That is easy for me as I don't run a evening feeding anymore, noon is the last, and only enough for the deer to clean up by dark (another anti-hog tactic I adopted). When I prep, I turn the ground gold with corn within the legs and activate the Boar Light and sit a 100-yard back. Once they come in, they are so busy trying to out eat each other that you can kill them all. They are making so much noise that it is easy to get up to 35-yards, I even put a little yard flag in the ground when I bait up, so I know where to stop. Anyway, I just added the XS Big Dot Tritium Front Sight to the barrel and I'm waiting on hogs to give it a try. Also, notice that in the hog picture above that it has the long 28" improved cylinder barrel, there is no change to the shoot distance of 35-yards. I also just bought a like new 24" adjustable rifle sight, cylinder bore barrel. Pondering cutting it off to a 20", but I want to start reloading the BBs. A friend bought a 25 lb bag for me. LB: I can give you some tips on smoothing out your new gun so you don't have to shoot 500 rounds to break it in.. There is a few things to deburr and the the gun will run like glass. not hard and you can do it. Mounting the sling requires a few inexpensive parts, but you really want to mount it on the sides of the stock with QD sling attachments. I've got to go now but I'll post pics later so you can see how I did it and the same will work for you. It makes the gun lay flat on your back when carrying it which is much preferable to the other way. After 3 trips to Front Sight with mine I've got the setup pretty well figured out, and after the last trip there were no changes made. It's right. Last edited by W.R.Buchanan; 11-08-2018 at 05:49 PM. Mine is kinda plain old wood but in god shape and all in all I like wood and metal. I can see the use for synthetic stocks and may even look to buying something for this gun or another if I find a beat up one. Wood dents and looks bad where plastic takes a beating and even if it gets scuffed up it is still waterproof and functional. The wood can be put back for "show". I am actually thinking of looking for another 500 now... but I guess I better shoot this one first before I spend more money! I'll post sight pics later. Good on you Kent! Now you you gotta find some Griz! Give the 7/8 oz Lee slugs a whirl outta that barrel as cast out of soft lead, easy and you might get a nice surprise. Oh, and your .678 RBs too. Nice! Yeah, I have to check fits now. My single shot has a sloppy bore so the 0.678" RB's in Winchester shotcups are a bit loose and have to be paper wrapped (tube like). They fit perfect in my old Pacific Verelite wads which are thicker petal. I haven't checked them yet in the Mossberg but they should be close to good fit in Winchester wads. Might need one wrap of paper to be snug. I'll check them out later. I do like round balls! Sized down then paper patched Lee slugs in shotcups do well too. Those I'll try in the Mossberg for sure. I'll try some as cast too but I like the custom fit of paper patching. Been thinking hard about that NOE Lyman clone mould too! Got the gun so am prepared but not sure I want a close encounter with a grizz! Populations are up so it is a distinct possibility though. Note the comment "There are approximately 15,000 Grizzly bears in British Columbia1—this is about a quarter of the entire North American population." The population in my area seems to be increasing. There's more sightings anyway. We have a very large population of black bears which are much more common. LB the actual piece parts to attach the sling in a universal manner are cheap. You need either 1 or 2 QD Push Button Sling Swivels. Magpul or other makes all work about the same. Midway sells these neato sockets that only allow the swivels to rotate a few degrees either way as opposed to others which don't limit rotation like Magpuls sockets! The ones that don't limit rotation are a PITB and are not cheap! These are $7.50 for 2 each and you drill a 1/2 hole in the stock or in the case of Magpul stocks you remove the plugs. Then run a 9/16-18 tap in about 3/4 of the way to the bottom of the hole and then thread the sockets in until the are flush and timed right. They look like a big set screw and have an Allen drive in them. You could probably just thread them into a wood stock without pre-tapping the hole..
You want one on either side of the stock. The one on the left side is used when you carry the gun across your back and the gun lays flat. The one on the right side is used when you are carrying the gun Cross Body like if you might need to shoot quickly. The last piece is the Barrel Band which allows for either a QD Swivel or on the other side a Snap Clip. I use the Snap Clip. Personal preference but that may change.. The Magpul Barrel Band comes with a loop on one side and a QD socket on the other and can be reversed. It also comes with a nut if you don't want to use the loop at all. I usually run my gun cross body when it is on me the rear sling swivel is on the right side of the stock out of the way of my cheek. This also keep the gun laying flat against my belly. In order to get it to carry across my back I simply move the Rear Swivel to the left side of the stock and the gun lays flat across my back or hangs flat for conventional carry. I make all my own slings out of 1.5" wide nylon belt material. It is the same material 5.11 uses for their TDU belts and the stuff stays soft and supple which feels good against your body. I actually made my first ones out of TDU belts! The side saddles are Velcro and are simply stuck to the left side of the Receiver. These are from Browncoat Tactical and are nice and hold onto the shells really well. $15 each. I also got some from China that were $2 each and work pretty well too. You need one of these on the gun and one in your pocket when you go afield so you have ammo on the gun at all times and can't forget it when not thinking about it. These guns are only marginal clubs and if you don't have ammo that's all they are. Bears are not going to respond the same way to being beaten with a shotgun, as opposed to being shot with a shotgun. Last edited by W.R.Buchanan; 11-08-2018 at 11:40 PM. Pretty slick Randy! I'll look into that. It would be nice to have it lay flat. The gun seems pretty smooth as is... surprisingly so. I was expecting something much looser and clankier with "stiff spots" but it is quite tight and smooth... in my opinion anyway. I'll have to get out the BPS and my son's 870 to compare. Just checked and the 0.678" RB is too loose in both Winchester and Claybuster wads and too tight in Pacific Verelite wads so will need a different wad or paper "shim" for fit. I'm going to have to get me an account on a photo hosting sight. I am burning up my Cast Boolits space! Still pondering that NOE mould too. I really want one but expenses have been kinda high lately. I still might do it. I have little will power when it comes to moulds. LB: they make pretty nice boolits! right at 500 gr. The gun will loosen up as you shoot it, detailing the inside only cuts down on the number of rounds required to break it in. They are very smooth actions and there isn't a whole lot of places they can loosen up. Last edited by W.R.Buchanan; 11-09-2018 at 12:07 AM. Did you cast from wheelweights or soft lead? I'm curious about field results... skirt compression for the most part.